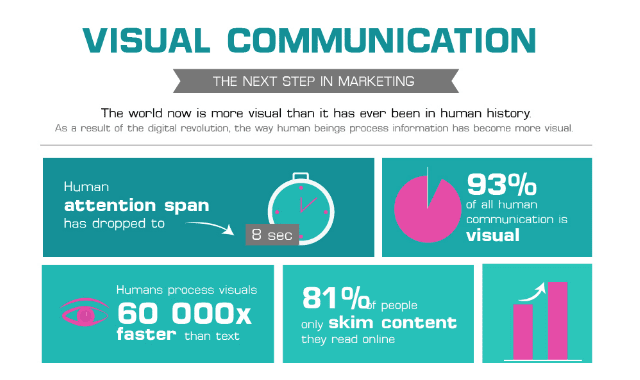 Visual Communication: The Future of Marketing #Infographic ~ Visualistan '+g+"
Did you know that you only read about 20% of most blog posts you stumble upon online? Yeah, that’s right! Unless of course, you are badly in need of information for something you are working on; but even then you would skim through the post, until there’s that image, graph or video that conveys the gist of the article. Gratified, you would ignore the rest of the article and focus your attention on that one piece of visual aid. It’s not just you; all human beings are biologically wired that way. Biologically wired to process visuals 60,000x faster than text.